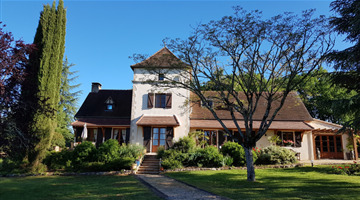 The property is located 1 kilometre from the village of Viennay and 4 kilometres from the main historic town of Parthenay, one of the main stop overs for the pilgrims on the route to St. Jaques de Compostelle. Their journeys end being the Spanish church of Santiago de Compostela. The area is predominately agricultural, sheep and cattle farming. The department is Deux Sevres and this particular area is called 'The Gatine' which means land ideal for livestock. Poitiers , LA Rochelle ,Nantes and Limoges all have airports which have regular flights to many locations in the UK and other countries.all within reasonable drive. From Calais ferry terminal it is about a 7 hour drive with a toll cost of roughly 40 euros. 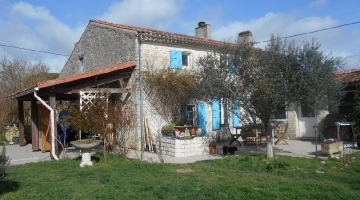 LA Rochette is a traditional French farm house (longere type from the 19th century) .It stands in 4 hectares (12 acres) of parkland with its own stream, large pond and wooded valley . The property is completely restored to modern standards. Walls consist of original granite 2 feet in thickness with cavity dry lined plastered insulated walls to all the interior. The wiring system is an excellent modern system and plumbing was replaced when the building was originally renovated with a new large electric water cylinder recently fitted. There is a satellite dish for UK TV reception. The property has two large chimneys, one for the salon which is a very ornamental open fireplace and the other in the kitchen has an electric fire. There is oil fired central heating . This covers an area of 54 square meters. Exposed beams and a magnificent original large bread oven,which is accessed from the salon but extends to the exterior . This makes an interesting feature without taking up any internal space . Quarry tiles cover the whole flooring area. The salon has 3 large oil fired radiators also a magnificent open fireplace. There are aerial connections for French/UK television, plus a telephone point. There are two doors to the exterior from this room . This room has new work surfaces over traditional french units. There is a new electric oven and hob. There are aerial connections for UK/French television, plus telephone point. There is an electric fire within a really unique fireplace. The kitchen also has a large radiator. The flooring is laid with quarry tiles as in the salon. There is an exterior door which is the main entrance to the property. Leading from the kitchen is a hallway which gives access to the separate ground floor toilet. Within this room a new electric water heating storage cylinder is located . There is terracotta wine racking for 250 placements. At the rear of the hall you enter the annex building which consists of two floors. The ground floor at present is used as a utility room but this part of the building has planning permission (already passed) to convert into a guest annex/ gite with a double bedroom/sitting room on the top floor and toilet/shower plus other utility conversions as necessary on the ground floor. This area has rear access door to its own garden and access to the private recently landscaped garden and park area. This area also has the new 2018 boiler for the central heating system. This is accessed from the salon. Access to the upper level is by a large wide ( 1.2 meters) oak staircase ,this leads to the landing /hallway. The hallway gives access to 4 bedrooms plus toilet/shower room and has 2 radiators. Aerial connected for French/UK television in this room. Plus telephone point. Telephone/ Internet point in this room. The toilet and shower room are next to the main bedroom and also has a radiator. This is a large double garage with remote controlled door to one bay and manual operated door to other bay. It contains a heavy duty work bench,5 meters long with 3 tool drawers. There is single and three phase power supplies .A very high roof enables possibility for staircase and mezzanine floor for storage/ office space to be installed . A supply of single phase and thee phase power is installed. The entrance to the property is by new double five bar gates. In the large front garden there is a well with a tiled hood and hand roller plus pump.The front garden has mature trees and shrubs and allows for privacy. There is unlimited parking space. From the property, the main land is accessed by another set of double five bar gates and also from the rear of the stable block. As mentioned the land covers an area of 4 hectare which has been worked to create parkland. There is woodland, picnic areas, a stream, valley and (pond roughly 60 meters x 20meters in size :- 1200 square meters)the pond has small carp and roach and is surrounded by mature trees. Many American oaks, ash and willows have been planted by the lake plus apple trees..
A walnut tree supplies a year's produce. There is an ornate covered bridge which is suitable for rider and horse/ tractor to traverse the stream so giving access to the far side of the park. The whole area enables horse riders to enjoy riding around their own property. The stable block has two stalls plus room for others if required. This area has its own direct access to the land through two sets of gates . The main stable has large, high double sliding doors which include a small door for normal access while the large doors can remain locked. The stable gives storage space for a caravan,tractor plus much more within the building. The floors are concrete. Within this block there is also a new tack room or storage . Joining this building there is another stable/sheep/cattle block with manger, this also houses the fuel oil tank for the central heating system in a walled off section. The property offers great potential if the new owner wished to pursue there own projects on the land and other various outbuildings but if not so inclined then no work is required. The sale offers someone the opportunity to acquire a very well appointed property, in a superb setting,with the potential of developing further accommodation for either private or holiday rental purposes . 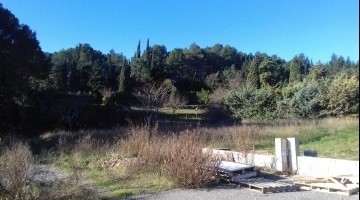 The boundaries of the property are secure and the land (registered bio) ideal for all kinds of pets and has also been used in the past,by the present owner,for keeping sheep. Finally all furniture will be included in this sale ( excepting obviously personal items. 3 Televisions and Kobta tractor mower will be also included. Major cost saving by not using property agent (12,000 a 14,000 euros) only Notaries fees to pay.